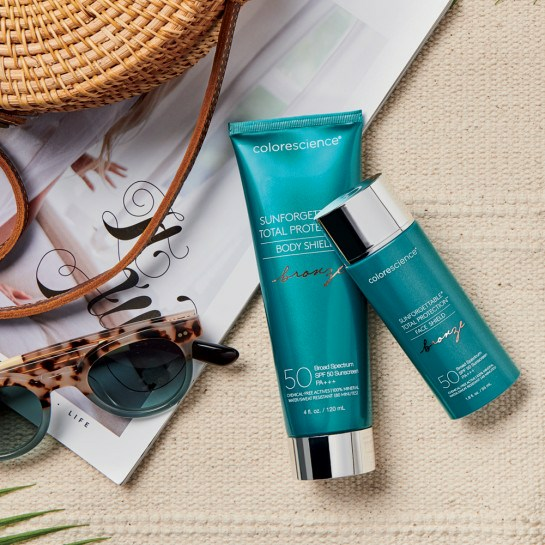 This limited edition duo features our Sunforgettable® Total Protection™ Face Shield SPF 50 and Body Shield SPF 50, both with a bronze tint that delivers the perfect natural, sun-kissed glow without the damage. Note: Natural separation may occur. Shake well before each use! Always 100% chemical-free actives, Sunforgettable® Total Protection™ Bronzing Duo goes beyond SPF to provide all-mineral, totally invisible daily defense from harmful environmental aggressors. Face Shield Bronze: Shake well before use. Apply liberally and evenly to face, neck, and décolleté. Reapply at least every two hours. Body Shield Bronze: Shake well before each use. Apply liberally and evenly prior to exposure to environmental aggressors. Reapply at least every two hours. How much do I need to apply in order to achieve full SPF 50 coverage? FACE Shield: Evenly apply at least a nickel-sized amount for the face and more as needed for neck and décolleté. BODY Shield: Evenly apply at least 1 ounce (enough to fill a shot glass) to cover the body. The Skin Cancer Foundation recommends that all sunscreens be reapplied at least every two hours. Do I need to shake it before application? 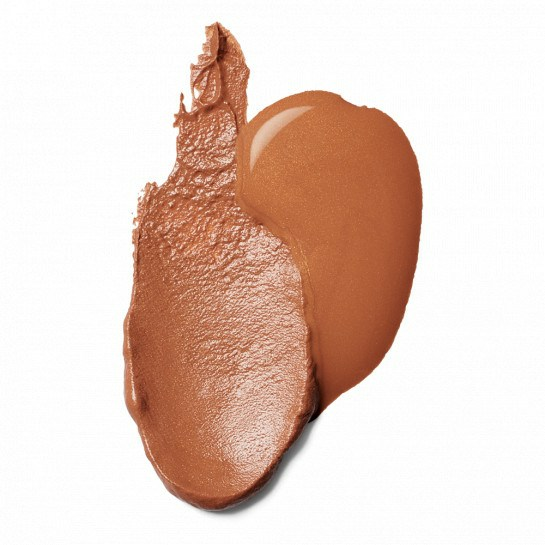 Yes, in order to ensure even color and full SPF coverage, shake both products well before each use. BODY shield: After 80 minutes of swimming or sweating. FACE shield: After 40 minutes of swimming or sweating. At least every two hours. Are the Bronzing Duo products self tanners or stains? Do they absorb into the skin? No, the bronzing duo products are not stains nor self tanners and are not absorbed into the skin. As these are all-mineral formulas, they sit on top of the skin and are therefore meant to be washed off. Do the Bronzing Duo products contain dihydroxyacetone (DHA) or other ingredients to prolong color? No, neither product contains DHA to prolong color. The bronze tone achieved by using these products will be temporary and easily washed off at the end of the day with water and cleanser. : No. Each has been formulated to be minimally transferrable, however, as with most bronzers be careful with light colored clothing and fabrics. It is also recommended to ensure the product has been fully rubbed onto the skin and allowed to dry. Wash hands with soap and water after application. 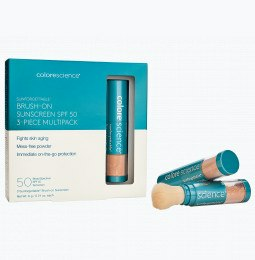 How long will the bronze color last after I apply the products? For best results, apply to clean, hydrated skin. How long the color lasts will vary based on activities, swimming and sweating. As with all SPF products, we recommend reapplying every 2 hours for continuous protection from environmental aggressors. Remove with water and your preferred cleanser/body wash.
What makes this new formulation different from original/non-bronzing formulas? These formulations include more iron oxides, as well as the addition of pearlescent pigments to give the products the bronze tone and subtle shimmer for a sun-kissed glow. Is the color coverage buildable? Yes, the more you apply, the deeper the bronze shade you will achieve. We recommend layering until your desired shade is achieved. It’s also helpful to note that as more product is applied, it may take longer to fully dry down. Are the Total Protection™ Bronzing Duo products water- or sweat-proof/resistant? 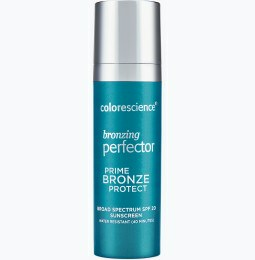 Yes, the Face Shield Bronze is water/sweat-resistant for up to 40 minutes, while Body Shield Bronze is water/sweat-resistant for up to 80 minutes. Are the Total Protection™ Bronzing Duo products non-comedogenic? Yes, both products are non-comedogenic. Are the Total Protection™ Bronzing Duo products hypoallergenic? Yes, both products are hypoallergenic. Are the Total Protection™ Bronzing Duo products gluten free? Yes, both products are gluten free. Those who have gluten allergies may experience sensitivity when using topical products. Total Protection™ is gluten free and therefore safe for those with Celiac disease. In addition, all Colorescience® products are 100% free from parabens, phthalates, synthetic fragrance, animal testing, talc, dyes, mineral oils, drying alcohols & chemical sunscreen. Are the Total Protection™ Bronzing Duo products paraben free? Yes, both products are formulated without parabens. 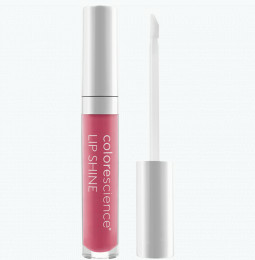 In addition, all Colorescience® products are also 100% free from phthalates, synthetic fragrance, animal testing, talc, dyes, mineral oils, drying alcohols & chemical sunscreen. Are the Total Protection™ Bronzing Duo products sulfate free? Yes, both products are sulfate free. In addition, all Colorescience® products are 100% free from parabens, phthalates, synthetic fragrance, animal testing, talc, dyes, mineral oils, drying alcohols & chemical sunscreen. Are the Total Protection™ Bronzing Duo products phthalate free? Yes, both products are phthalate free. In addition, all Colorescience® products are 100% free from parabens, phthalates, synthetic fragrance, animal testing, talc, dyes, mineral oils, drying alcohols & chemical sunscreen. Are the Total Protection™ Bronzing Duo products oil free? Yes, both products are oil free. In addition, all Colorescience® products are 100% free from parabens, phthalates, synthetic fragrance, animal testing, talc, dyes, mineral oils, drying alcohols & chemical sunscreen. Are the Total Protection™ Bronzing Duo products vegan? Yes, there are no animal products or derivatives in Total Protection™ Bronzing Duo products. In addition, all Colorescience® products are 100% free from parabens, phthalates, synthetic fragrance, animal testing, talc, dyes, mineral oils, drying alcohols & chemical sunscreen. Do I need to moisturize before I apply the Total Protection™ Bronzing Duo products? While Sunforgettable® Total Protection™ Bronzing Duo products were formulated with ingredients that hydrate and nourish, they are best applied to moisturized skin, particularly for those who have dry or fragile skin. Are the Total Protection™ Bronzing Duo products safe for sensitive skin? Yes. Sunforgettable® Total Protection™ Bronzing Duo products are 100% mineral protection that are free of chemical active ingredients, oil free, hypoallergenic, non-comedogenic and are suitable for all skin types. Are the Total Protection™ Bronzing Duo products suitable for oily/acne prone skin? Yes, Sunforgettable® Total Protection™ Bronzing Duo products are 100% mineral protection (free of chemical active ingredients), oil free, hypoallergenic, non-comedogenic and are suitable for all skin types. As with all SPF products, Sunforgettable® Total Protection™ Bronzing Duo products should be applied 15 minutes prior to exposure. Like all SPF products, reapply every 2 hours. 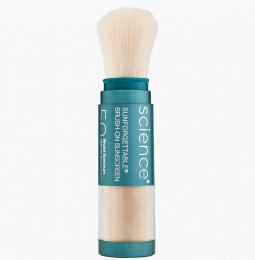 For convenient, all-day reapplication on-the-go or directly over makeup, Use the Total Protection™ Brush-on Shield SPF 50 every 2 hours. Sunforgettable® Total Protection™ products have a 12-month expiration from the time after opening. Water, C12-15 Alkyl Benzoate, Butyloctyl Salicylate, Isododecane, Lauryl PEG-8 Dimethicone, Tridecyl Salicylate, Dimethicone/Vinyl Dimethicone Crosspolymer, Propanediol, Dimethicone, Caprylyl Methicone, Niacinamide, Mica, Dimethiconol/Propylsilsesquioxane/Silicate Crosspolymer, Trilaureth-4 Phosphate, Allantoin, Tremella Fuciformis Sporocarp Extract, Bisabolol, Disodium Lauriminodipropionate Tocopheryl Phosphates, Caesalpinia Spinosa Fruit Pod Extract, Helianthus Annuus (Sunflower) Sprout Extract, Glycerin, Lauryl PEG-10 Tris(trimethylsiloxy)silylethyl Dimethicone, Maltodextrin, Sodium Chloride, Ethylhexylglycerin, Isoceteth-10, Silica, Betaine, Capryl Glycol, Dimethylmethoxy Chromanol, Hexylene Glycol, Tetrasodium Glutamate Diacetate, Sodium Hydroxide, Dehydroacetic Acid, Salicylic Acid, Phenoxyethanol, Potassium Sorbate, Benzoic Acid, Iron Oxides (CI 77491, CI 77492, CI 77499), Titanium Dioxide (CI 77891). Be the first to write a review of Sunforgettable Total Protection Bronzing Duo.